Bow Flags Will Get Your Property Noticed! 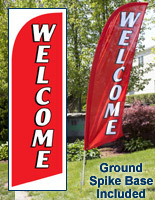 Get Home Sold Faster with These Banners! 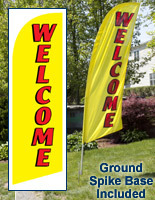 A Ground Stake is Included with These Bow Flags! 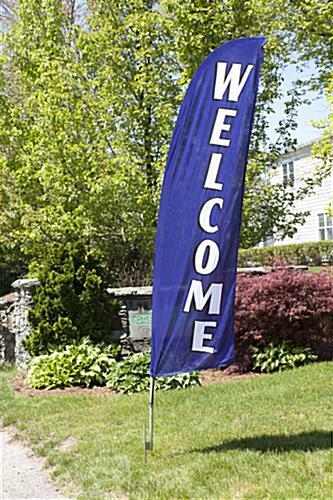 These 8' bow flags, also known as realtor banners, have font reading "WELCOME" on a blue background. Due to the relatively generic message of the pennant, many businesses can use it, not only realtors. These bow flags that welcome guests are meticulously engineered to balance portability and an eye-catching design with an affordable price. 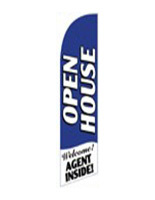 Portability makes these feather banners especially well-suited for use by real estate agents, sales men, or anyone requiring a promotional display they can transport and setup easily. What features make these welcome bow flags portable? First, the pole consists of (2) aluminum and (2) fiberglass segments, which detach from each other. These feather banners are bow flags that include a black bag, which features a separate compartment for each piece of the unit. With all the components loaded into the bag, it weighs only 4 lbs. so virtually anyone can carry the feather banner. 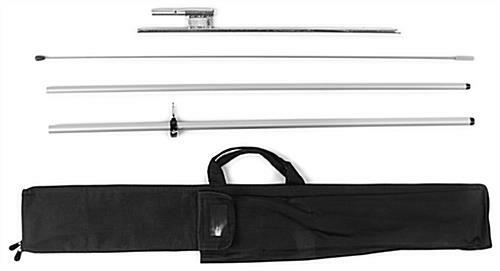 The bow flags require only one person for assembly, and easily fit into a car trunk once inside the bag. The banner has a poly knit construction for outdoor use. 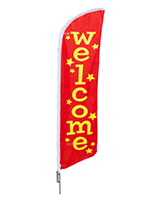 These feather banners are bow flags that flutter in the wind as a result of the ultra-lightweight fabric. A bungee cord connects the banner to the pole to ensure the banner does not fly off when the wind gusts. Bow flags come with a ground spike base because it provides the most versatility for placement on all types of properties. 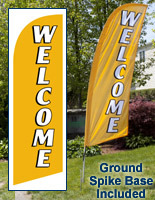 Businesses can position the welcome banner next to a road. 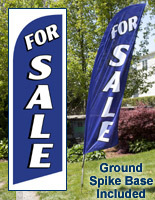 Real estate agents can place these bow flags in the front lawn of a property. 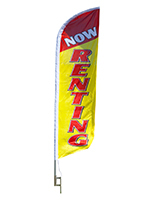 Property managers often place these welcome bow flags along the entrance to an apartment complex in conjunction with "FOR RENT" and "1-2 BEDROOM" banners. 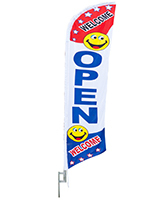 The fact so many different users can utilize this welcome flag allows it to be mass produced and kept in-stock, which results in the affordable price and short lead time. The combination of durable construction, eye-catching design, portability and inexpensive price makes these feather banners a cost-effective addition to any promotional campaign!